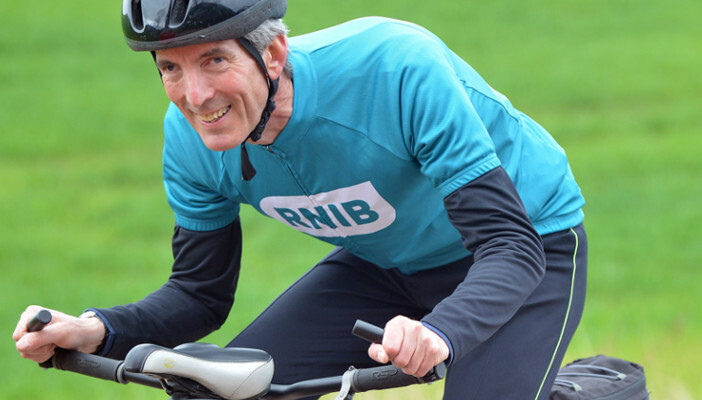 Ken Reid 56, is a former chairperson of RNIB Scotland from North Berwick. Ken was diagnosed with the degenerative eye condition retinitis pigmentosa in 1986, and was told he was losing his sight. Ken Reid will cycle to each of the five capital cities of the British Isles across this summer – a trip of about 750 miles. Ken will be accompanied by co-cyclists, and will leave Edinburgh and cycle to Cairnryan. He'll then ferry to Belfast where he'll cycle down to Dublin. From there he'll take another ferry to Holyhead for Cardiff, and on to London. The trip should take around two weeks in all. By making this journey, Ken wants to increase awareness of the journey that more than 100 people across the UK start every day towards sight loss. In particular, Ken wants the money he raises to go towards producing more talking books that are a lifeline for people with sight loss. For updates on what Ken's been up to, follow Ken's Facebook page. If you'd like to sponsor him, visit Ken's JustGiving page. If you're feeling inspired by Ken’s riding adventure, then why not set your own riding challenge? We have limited places left for this years' Prudential RideLondon-Surrey 100, so register today!